Hearing loss might appear at first to be a mere annoyance or minor health issue. However, hearing loss can have severe and negative results if left unchecked. In the workplace, hearing loss can adversely affect employability and workplace productivity, which has far-reaching effects into society. According to the World Health Organization, or WHO, expenses related to hearing loss in the work environment can cost upwards of 750 billion dollars each year. Although the problem of hearing loss greatly impacts areas such as education, employment, physical health and overall well-being, it is still one of the most overlooked health issues, and it brings with it costly consequences. Sufferers of hearing loss are faced with heightened rates of anxiety and depression, which are often treated with prescription drugs. Hearing loss could be a symptom of an underlying health condition, such as cardiovascular disease. If ignored, the root problem only worsens. Furthermore, untreated hearing loss often results in dangerous situations, including not being able to hear warnings alarms or sirens. Add all of this to the cost of auditory aids and treatments, and it is clear to see why companies are reeling from increasingly high insurance premiums. Held annually on March 3rd, this year’s World Hearing Day focused on raising awareness in the political realm. Marketed as “Make a Sound Investment,” advocates aimed the current campaign at influencing politicians and policy makers to deeply consider the societal effects of hearing loss in hopes of eliciting real and sustainable change. Without assistance, hearing capabilities continue to decline as the auditory muscles weaken from lack of use. Over time, this spirals into auditory deprivation. 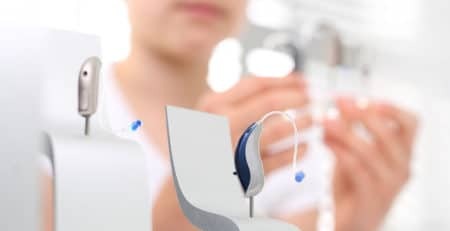 Properly addressing hearing loss concerns through the use of hearing aids and other auditory treatments can positively impact one’s life in all areas, ranging from relationships at home and work to providing an overall boost in self-confidence and independent daily function. Awareness of hearing loss and its consequences leads to taking control of one’s health. Hearing loss is not and should not be treated as an insurmountable obstacle. Hearing aids can dramatically increase quality of life both at home and in the workplace. It is imperative that hearing aids reduce the added stress and effort on the user. One’s cognitive abilities should not affect the ability to hear with clarity and precision. The decision to utilize hearing aids is often not an easy one. Factors including cost, embarrassment or the perception of feeling old often sway people not to use hearing aids. They may try to convince themselves that they can work productively without them. With maximum discreetness and effectiveness, there is no need to suffer in silence.